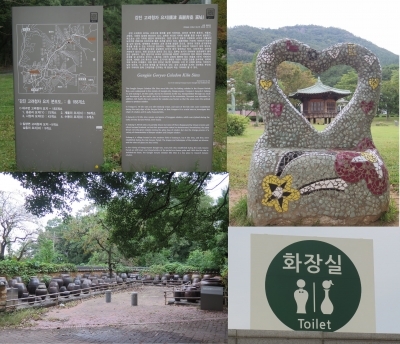 Kangjingun Kiln Sites is part of the Tentative list of Republic of Korea in order to qualify for inclusion in the World Heritage List. From just seeing the title I am thinking that this site and the Chinese 'Imperial Kiln Sites of Jingdezhen' are pretty much identical but I can't say this from not being at the latter. I wouldn't be surprised if someone comes along and says there should be a cross-nation connection to inscribe both places. Arriving by car the site is very easy to find. There are signs from the highways and the navigation was correct to find it. Once I had arrived, however, I wasn't sure what to do. There is not visitor center per se, in fact there is no ticket for this site and aside from a bus from an adult Down syndrome center using the park facilities there were no tourists whatsoever. Said park facility are basic but accomodate coming even with a crowd and picnicking is easy. There are also several shops for buying food items. But we want to review the kiln site, right? At first I didn't find it. In the end the kiln processing units are hidden behind the museums. In what I would call a very "Korean" approach (see Jeju Island) there at least half a dozen museums spread about, with the biggest one probably the pottery museum. As everything was Korean I did not want to waste my time going inside so I cannot tell if there were sections for the kiln processing - I doubt it. So after I skipping this and following some obscure signs into the hills beyond of what would normally be the building's delivery entrances, across from those are some small houses that are off-limit to visitors. There are some signs to explain the units which gives you the feeling that you at least saw what you came for, even if you didn't get much education value from it. Would I recommend the site? No. It is, however, near enough to other interesting places in southern Korea that are WHS or potentially in the future (maybe not the dinosaur museum).